Sixteen-year-old Laura Roper, Mrs. Lucinda Eubanks, and children, Isabelle 3, and William 6 months, were captured by Indians at "The Narrows," Little Blue River, on Aug. 7, 1864. Laura and Isabelle were released to the Army at Hackberry Creek, KS, in Sept., 1864. Lucinda and baby, brutally treated by the Indians, were finally released near Fort Laramie, WY in May, 1865. This marker is dedicated to the memory of Laura Roper, the Eubanks, and pioneers of the Little Blue Valley. 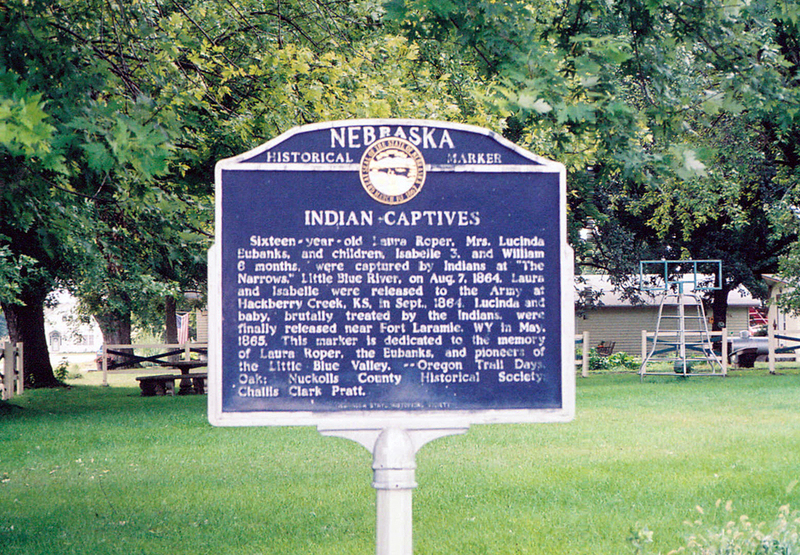 “Indian Captives,” Explore Nebraska History, accessed April 19, 2019, https://mynehistory.com/items/show/379.